Fortnite, the massive Battle Royale hit available on PS4, Xbox One, PC and iOS, found a new home at E3 2018 today: the Nintendo Switch. Any Nintendo Switch owner can now go onto the eShop and download Fortnite: Battle Royale for free right now. Console-quality free-for-alls on the road could make the Switch a popular choice with fans. But many veteran Fortniters discovered an unpleasant surprise waiting for them when they tried to log into Switch with their old Epic Games accounts. No account previously linked to a PSN account can log in on a Switch console. Gamers who have tried have been met with a “Login failed” message. Even worse, PS4 owners can't solve the issue by unlinking from their PSN accounts, which apparently isn't permitted. Starting from scratch is the only solution Sony has permitted Epic Games to offer. 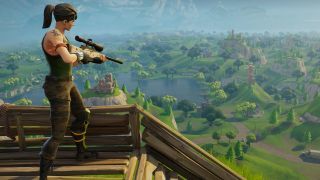 Sony, which has previously faced criticism for refusing to allow cross-play between PS4 gamers and Xbox One gamers for Fortnite matchmaking, evidently hasn’t softened its stance for Nintendo gamers either. This essentially means that you must create a new account and lose all of your ranking progress to play on Switch. And Epic Games’ somewhat passive-aggressive error message makes it clear that it isn’t any happier about it than its fanbase. Sony’s stubborn isolationism could ironically have the effect of convincing Fortnite fans to make the Switch (or Xbox) their primary Battle Royale console, since it allows them to play against a larger group of opponents without restrictions. You need only look at Reddit and the Resetera forums to see the immediate backlash that has occurred, as excitement for Nintendo fun turned quickly to anger directed at Sony. So far, Sony has issued no comment to this current controversy. It also has previously forbidden cross-play for Minecraft or Rocket League, while Microsoft and Nintendo allow it.